For those of you who love history, Pigeon Cottage has it in spades. Pigeon Cottage is situated within Britain’s oldest intact Tudor hamlet, Hengrave. It’s a grade two listed former estate cottage of Hengrave Hall which was sold off from the estate in the 1950s. It was once the village Post Office before it was converted back to a dwelling in the 1970s. I bought it in 1986 and have been restoring it ever since – owning a historic house is definitely a labour of love as nothing is ever quite as it seems! Arguably, the house owns you. 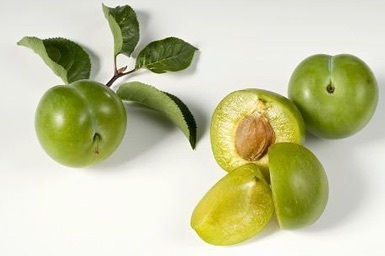 Hengrave’s place in food history is that this is where the green-gage, a new type of plum, was first developed. Heraldry and images from the village sign in Hengrave. Most villages in Norfolk and Suffolk have beautiful, usually carved, wooden signs on their village greens or exit and entry roads. Inexplicably, Hengrave didn’t have one until 2006 when the Parish Council commissioned one with a grant from the Millennium Fund. I was lucky enough to be the Councillor in charge of researching and commissioning the sign. It’s beautifully old and weathered now and here it is in all of its original oak carved glory, made by the Harry Stebbing workshop. The key figure is Sir Thomas Kytson – more of him later. One of the most important historic houses in Suffolk, it’s located a few miles outside Bury St Edmunds in the valley of the River Lark and has a truly illustrious history. The Hall stands in its own grounds, many of the pretty thatched estate cottages were sold off to the public in the 1950’s – Pigeon Cottage is but one of those. Unfortunately, Hengrave Hall is no longer open to the general public nor do the villagers have access as it’s a private wedding and conference venue now, but our families spent many happy hours there prior to its sale in 2006. 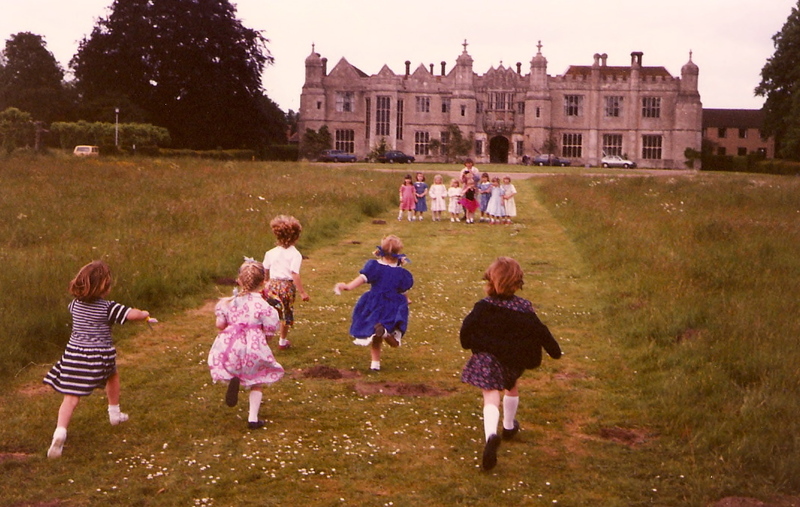 We’ve had birthday parties and treasure hunts in the grounds, it was our daily playground and we miss it. The south front, gatehouse and inner court are great examples of sixteenth-century domestic architecture, but the most breathtaking feature of the house is the oratory, which contains beautiful linenfold panelling and a window of superlative stained glass. This was manufactured in Picardy in the 1520s and brought to Hengrave in three great chests by boat to Ipswich and then by cart. The window with its biblical scenes is regarded as one of the finest examples of its type in Britain. There’s also a banqueting hall, complete with minstrels’ gallery, and the dining room, which has a superb Jacobean fireplace. It’s tall enough to stand in. You can see more images of the beautifully restored house and gardens on the Hengrave Hall website. Hengrave’s origins lay in the manor of Hemegrede which is mentioned in the Domesday Book as being in the ownership of St Edmund’s Abbey. The manor was later granted to Leo, whose grandson, Thomas, assumed the name de Hemegreth or Hengrave. The Hengrave family later fell from favour and sold their land to Thomas Kytson, a wealthy merchant originally from Lancashire who dealt in luxury textiles. Such was his wealth and status, he decided he also needed a country residence in England and so he commissioned the building of Hengrave Hall, on which work was started in 1525. The house was not complete until 1538 and cost £3,000 to build, a sizeable sum by contemporary standards. Both brick and stone were used, probably removed from demolished local abbeys and monastic houses following their dissolution by King Henry VIII. By this time Kytson had been knighted and had also served as Sheriff of London, however, he only enjoyed the completed Hengrave for a short period before his death in 1540. His son, also Thomas, inherited the estate and in 1578 entertained Queen Elizabeth I at Hengrave in considerable style, earning himself a knighthood in the process. Such royal favour notwithstanding, Sir Thomas and his wife were in constant trouble on account of their Catholic beliefs and were listed as recusants (people who refused to attend Church of England services) in 1588. Hengrave, home of the green-gage! Hengrave later passed to the Gage family, also Catholics and it remained with them for nine generations. Their period of ownership was characterised by the demolition in 1775 of one wing of Kytson’s original hall and the filling of the moat, as well as by popular stories surrounding the family’s development at Hengrave of a new type of plum – the ‘green-gage’. Sometime before 1724, plum trees of the Reine Claude type were sent to Sir Thomas by his brother who was a Catholic priest in France. The labels on the saplings were lost in transit and his gardener simply called them ‘Green Gages’. Not much time was lost before that’s how they were listed under this name by London nurserymen. In the garden next to the Hall is the Church of the Reconciliation. 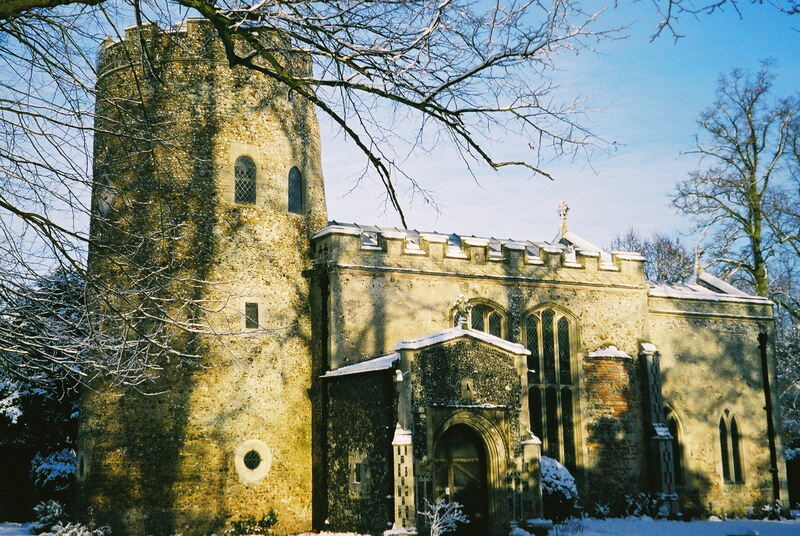 Although this building has Saxon origins, it has a round tower, and the nave is mostly thirteenth century, much of what we can see today dates from the 1400s when the building was enlarged and embellished. At the time of Sir Thomas Kytson the church – then serving as the parish church for the village – was enclosed within the grounds of the hall, and became a private chapel for the Kytson family. Inside the church is an extraordinary collection of marble and alabaster tombs and monuments including the 1608 memorial to the second Sir Thomas Kytson, flanked by his two wives (the first died, and he later married again). A monument to his father, also Sir Thomas, and the builder of the hall, lies nearby in the north chapel. In the nineteenth century, the family restored much of the house and landscaped the garden, pleasure grounds and wider estate. Hengrave passed to the Earl of Kenmare in 1887 and during the First World War was used as a hospital. It remained more or less empty thereafter until a big sale in 1952 when most of the contents (which had included a portrait by Holbein of the first Sir Thomas Kytson ) were sold at auction and the house itself was acquired by the Sisters of the Assumption for use as a school. In 2006, it passed into private hands and is now a wedding venue.